AFC - 12/10/14 I Would Never Kill or Eat an Animal! After his performance in Zagreb Salata in 2006, singer and animal rights activist Morrissey is returning to Zagreb to mark the release of his new album "World Peace is None of Your Business," with a concert on December 12, 2014 at 8 P.M. in pavilion 9 at the Zagreb Fair. In his song "I'm Not a Man" from his new album, Morrissey sings "I'd never kill or eat an animal/And I never would destroy this planet I'm on." With such a stance, this musician stands out amongst many famous people with his strong ethical beliefs and loud support for animal rights. He has been vegetarian since he was 11. 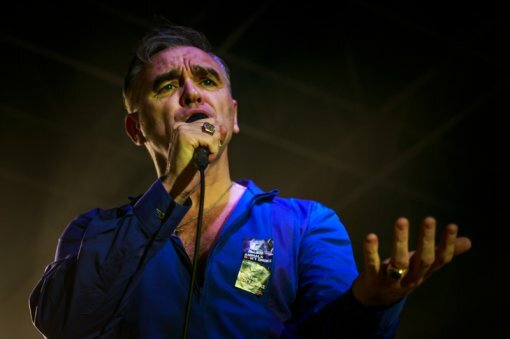 Morrissey experienced a life change when watching a British documentary about a slaughterhouse. He explains his vegetarianism with this simple logic: "If you love animals, it obviously makes no sense to cause them pain." The song "Meat is Murder" sang by Morrissey's cult band The Smiths, which came from their 1985 album of the same name, relays a strong and direct message against killing animals for their meat. With verses such as "This beautiful creature must die/A death for no reason/And death for no reason is murder/And the flesh you so fancifully fr/ Is not succulent, tasty or kind/It's death for no reason/And death for no reason is murder." This song has inspired and encouraged many to stop eating animals even to this day. Morrissey believes that no good argument for eating animals exists: "Some people jokingly say: Well it's tasty!, but it is only tasty when you season it well, cook it, decorate it and add 300 things to disguise the true taste - if you seasoned a chair or fabric, they would probably taste good too." He also said, "Eating meat is the most disgusting thing that I can think of. It is like biting into your own grandmother." Morrissey never sends a letter without sticking a sticker containing an activist message on it and he considers these little gestures very efficient. He strongly criticises public figures who promote meat eating, and he further expresses his own uncompromising stance by banning meat products from venues where his concerts are held. In 2002 together with the Dalai Lama and Australian supermodel Imogen Bailey, he invited all to boycott Thailand until the government of Thailand banned the cruel treatment, keeping and dressage of elephants as well as their exploitation for commercial purposes and fun. In 2004, he participated in PETA's campaign against lams cruel testing on dogs and cats, whilst in 2005 he included PETA's research documentary "Meet Your Meat" in his DVD "Put the 'M' in Manchester." Morrissey firmly represents animal rights, even when it is not beneficial to his career. In March 2006, he said that he would not include Canada in his world tour as a protest against Canada's annual "barbarian and cruel slaughter" of seals and he called for a boycott of Canadian products. The same year at the concert in Zagreb members of Morrissey's band wore t-shirts with the slogan "Meat is Murder," which they were given by Animal Friends. At Coachella Festival in 2009, Morrissey left the stage due in part to the audience eating meat. He said that the smell of cooked animals makes him feel ill and that he cannot stand it. Morrissey says that he is extremely proud of the fact that a large number of people have said to him that they stopped eating meat because of his attitude about it.